Shadow Loves Rouge. . Wallpaper and background images in the ROUGE THE BAT club tagged: purple bat rouge shadow. This is my favorite couple!!! They are perfect for eachother!!! yay!! shadouge4ever!!! and yes they ARE PERFECT 4 EACH OTHER!!! so forget you boredhedgehog!! Hey shadow34 YOU back off! Shadow is MINE!!! i always support that couple!! but i didnt say i did not love shadow...ALL OFF YOU BACK OFF!!! shadow is alone. he just works with rouge as a partner. Or does he? See if Rouge is the only girl who works with him, plus the only girl to understand him and be able to make friends with him, shouldn't this couple be suitable?! Knuckles guards the Master Emerald and doesn't trust many people to - you know - be for example - alone with it. He would not like Rouge much since she is with Shadow, therefore, possibly likes him. Shadow I mean. Shadow just grouped up with a bunch of loners to help himself through finding out who he is and stuff. Amy would not suit Shadow since Shadow won't like her extremly high pitched voice and the fact she likes hugging people. And she is a girly girl who is full of her self and a bit ditzy. 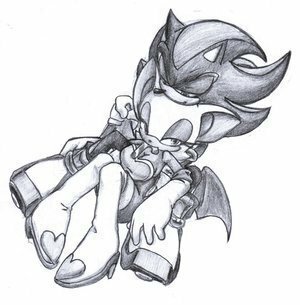 Rouge : Thanks for saving me, Shadow. Shadow : No problem. There's no way I'll lose a guy like that who blames his faliours ( is that how it's spelt? Forgot lol ) on his own past. Rouge : That's my Shadow! Rouge : Hey, why don't we take a peek into our own future? Shadow : I think I'll pass. Rouge : Come on, it might be fun! Rouge : Come on Shadow. The least we could do is treasure hunt together. See? I'm gonna end it there. But there is a slight chance they are more then friends. Just slight. BACK OFF B*TCHES!!!!!!!! SHADOW IS MINE!!!!!!!!!!!!!!!!!!!!!!!!!!!!!!!!!!!!!!­!!!­!!!­!!!­!!!­!! look ShadowHedehog!!! u r an a--hole!!!!! "what did i dio to deserve this ugh" u make me sick! r u saying Rouge is lazy and ugly and not good enough!!!??? ur blind!! !